What I would like to know is which cards should I consider and is it worth me upgrading the graphics card, or should I wait until next year when I might have more money available? Information taken from the summary page of Speccy. I am open to any suggestions, even not related to the graphics and sound cards, and will post images of the inside of my PC in case size or slots of the cards if they are important (taht’s not MY PC in the featured image). One issue I would like to resolve is that intermittently the screen gets garbled for half a second. Also, when recording at 60 FPS (not games, I don’t think) the screen seems to lose resolution every two seconds or so. Although I am about to try a new screen capture application, so that may solve it, but I think it’s due to my card or drivers. If you would like any more information about my system, just ask. when I built my system I bought a new Pentium processor and my nephew bought a secondhand one for half the price and a significant performance boost over my system. His system is still working as good as mine! My graphics card starting acting up so I removed it to see what it was in case I had to dig deep for a replacement. The fan was clean, as I use a blower to clean them all, but under the heat-shrinks cover plate there was a felt pad – of accumulated dust! It was like a new card after that and those niggling graphic errors and crashes had gone, all due to simple overheating! I have an inflatable boat pump to blow the living daylights out of the case and fans now. Taking careful ESP precautions of course! you could wait for the amd r9 480 which will be very cheap but very powerful (efficient power consumption too). Although it will be 200€, not 150€. Prices will obviously vary between countries. That’s too expensive for me. I have 125 for a graphics AND a sound card. graphics card for less than 125€ will be hard. Maybe you can find a r9 270x for that price. All prices are first hand of course, so you could always buy second hand and get it even cheaper. I think it depends a lot on what you want to do with it. Obviously, Half-Life 2 isn’t really going to benefit from more power. What games and applications are you looking to run, or make look better, that you can’t right now? I don’t know much about ATI cards, but the 750ti is a venerable card and people on Steam have reported success running Doom on it. Course, that’s also a well optimized game. It’s pretty much the bare minimum for modern games now. I had a 550ti for years and it was only in the past year or so when it struggled with newer games. That said, the 1080 series is out now, so I would expect the 950/960/970 cards to fall drastically in price to the level where the 750ti is. If you want something that will keep you afloat for the next few years, those are likely a better bet, provided your power supply can handle them. I had planned to upgrade the 550ti machine to a 970, but things happened and I was like, screw it… new PC. I haven’t dealt with sound cards for years. I just use whatever is integrated into the motherboard. I’m not enough of an audiophile to notice. I feel like any gains there would be pretty marginal and I’d agree with Rob that the setup is more likely the problem. if he wants something that will keep him afloat for the next few years, the r9 480 is the way to go. It is as powerful as a 970, has more VRAM and power comsumption is low. Might also benefit more from DX12. But he already said that it’s too expensive, but the card is not out yet anyway. btw for capturing footage you could always use nvidia shadowplay or amd’s equivalent. Both record without any performance loss (maybe 1-2 fps). Quality is not perfect, but more than good enough, youtube compression will kill it anyway. I would hold off on the sound card purchase if I were you. When you say you’re unhappy with your microphone’s quality, whether you mean the reverb of an untreated room or you mean hiss, noise and other such actual mic problems, a sound card upgrade won’t do you any good. If your problem is the reverb, you’d be better off with one of those little vocal booths you linked, since even highly directional microphones can only do so much to hide an untreated recording space, and the sound card has nothing to do with it. If your problem is the mic itself, a new sound card won’t get you anything, since the Perception 120, like all USB mics, does its own internal A/D conversion, and doesn’t go through the sound card at all when recording. You would need a new USB mic, or a traditional XLR mic and new audio interface to go along with it. Incidentally, most audio production has moved away from actual sound “cards” over the past ten or fifteen years, instead preferring outboard USB interfaces as an alternative to the electrically noisy nature of most motherboards that’s also more conveniently portable. In any event, any USB mic or XLR mic/USB interface you could get for €25 isn’t going to be an upgrade over the Perception 120, so if you really want a new mic and/or interface I would just hold out until the money is there. Or look at something like this for reverb, though it’s slightly over your budget and I have no idea where you’d get it in Europe (B&H ships worldwide, but I don’t know what that’d cost). As far as the video recording is concerned, although it does sound like you’re due for an upgrade considering your current graphics card, I wonder if you could clarify a couple of things. When you say your screen gets “garbled” and “loses resolution”, is that two separate problems? And are they only evident in the recorded video upon playback, or is your screen actually having problems during the recording? If it’s happening on screen while recording, I have no idea where to begin with that. If it’s only in the resulting video, though, one or both of those issues could be descriptions of “keyframe flashing”, where quality jumps suddenly at video keyframes in formats using intraframe compression (e.g. MPEG2, H.264). If it’s not happening in games, but only desktop capture stuff, it might very well be worth trying other screencast software. What are you currently using, and with what settings? Ugh, sorry, stupid typo, I meant “interframe” compression, i.e. compression across multiple frames. Intra is within individual frames, no keyframe flashing since they’re all keyframes. With regard to the microphones sound quality, it’s not the echo but the general quality. When I hear other people’s recording they sound so much better than mine. I know the room where I record is mostly solid, hard walls but even when I have built little duvet covered tents, I’m not that happy and it’s not the vibration from the PC either as the tents are on the other side of the room. I take you point about the sound card and that was one of my doubts, since the mic doesn’t even plug into it. That said, it might be nice to have better sound anyway. I think I’ll just try to make my own booth. It’s just a box and some foam. Onto the video. Yes, it’s two problems. Just using the PC results in intermittent garbling for flashes. I can’t seem to be able to recreate it, but next time it starts to happen, I’ll use my phone to record it. The other problem only happens on screen capture. Later today, I am going to take the box into my garden and spray some air into it. I know it’s very dirty and maybe it is over-heating. If just using the PC gives intermittent flashes, then yes, I agree with the compressed air approach, and maybe also update your drivers just to be sure. As far as your acoustic booth, I can’t offer advice since I haven’t gotten around to making my own, but good luck with the project! The DIY stuff is always fun, and a lot more satisfying when it’s finished. It’s a soft plastic box from Ikea for clothes and some of my clothes. I “think” it’s better but the recordings are conclusive. The problem is that when I am recording audio only I am much closer. It’s when I record the Ville type videos that the echo is really noticeable. Yeah, that’s the thing with those boxes. 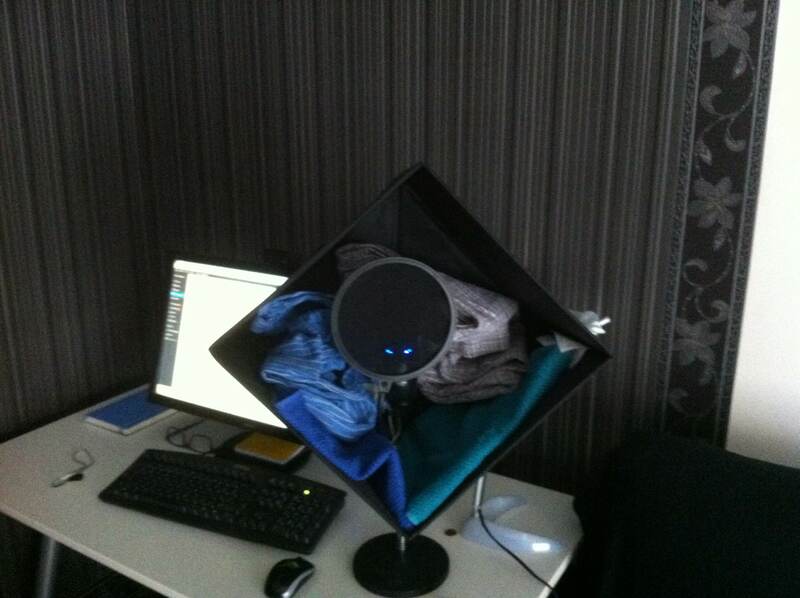 The idea is to trap the sound waves from your voice before they have a chance to continue onward and bounce off the walls (or anything else), which means you have to be up close to the mic, with the box behind it directly in front of you, for it to work. For your Ville introduction videos, you might want to try framing your shots a little tighter and putting the mic as close as possible to your mouth while keeping it offscreen. That, or just accept having the mic visible on camera, as long as it doesn’t obscure your face. Ultimately, of course, I don’t imagine most players have minded the boominess of the past few videos too much, since your voice is intelligible and gets the point across. Sorry to clutter this thread with another comment, but the more I think about it the more I realize I might be talking out of my backside with regard to those mic boxes. I’ve never used them before, and had just been assuming they were to stop your voice from escaping, but now it occurs to me they might be more for stopping outside noise from reaching the mic. That is, your voice still makes undesirable reflections by bouncing off of objects, but the only sound that gets to the microphone is what’s coming in the open side. Seems obvious in hindsight, but hadn’t occurred to me earlier. You might actually benefit from using one even if you’re not speaking directly into it, as long as the open side is aimed at your mouth and there are no acoustically reflective surfaces right behind you. that said im using a asus xonar dgx which i got for £22 and its not too bad .. but then that would significantly limit what graphics card you can get …..
i hope this helps phillip …. Looking at your spec one thing strikes me. Your RAM is running single channel running at 800MHz, rather than dual-channel at 1600MHz. Why? Have you only a single stick of RAM? I’d certainly look closely at that and consider upgrading with another stick. It won’t get you 2x the speed as some people think but should give you a 10-15% increase with the increased bandwidth. Not really noticeable in the real world but useful for a cheap upgrade.